In a unanimous vote, the San Francisco Board of Supervisors this week passed Supervisor and mayoral candidate David Chiu’s resolution calling on the SFMTA to initiate more pilot projects on Market Street to further restrict private auto traffic and make it car-free on a trial basis in advance of the 2015 redesign. The 11 votes were a strong message to the SFMTA that it needs to take more immediate steps to calm private auto traffic on parts of Market Street that are a mess for Muni, and a danger to bicyclists and pedestrians. Drivers turning left onto Market from Montgomery (which turns into New Montgomery) are an ongoing problem, because they use 2nd as a cut-through to the Bay Bridge, creating a backup on Market that sometimes delays Muni all the way up to 6th Street. Yesterday, a number of parking control officers (PCOs) had already been deployed to Market Street, including the congested 3rd/Kearny/Geary and New Montgomery intersections. At New Montgomery, some drivers had trouble complying with the PCO’s orders. I witnessed an angry SUV driver hop out of his vehicle in the middle of the intersection, and confront the PCO in a threatening manner. He backed down after an SFPD unit pulled up, but then nearly ran over a cop, and was ordered to pull over. I wasn’t able to witness the conclusion. The two back to back signal lights for northbound traffic crossing Market and then Geary are sometimes confusing for drivers. The first light for Market turns red, while the light for Geary just behind it remains green for a few seconds. Seeing only the green, drivers sometimes dart across Market when the signal they should be obeying is actually red. “It’s good to see the SFMTA taking some steps, but we need to see more pilots more quickly,” said Judson True, an aide to Chiu. In reality, it would seem that only Mayor Ed Lee has the power to make changes happen more quickly on Market. 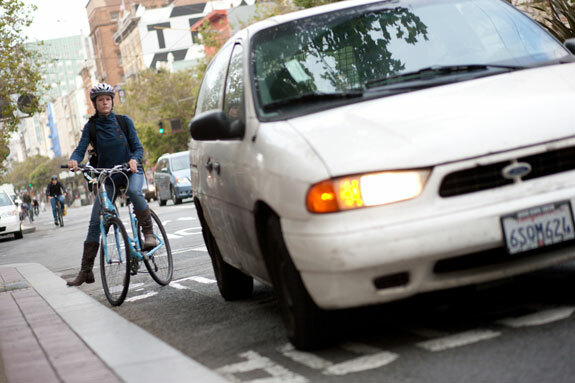 Without his support, the SFMTA lacks resources and political power. During last week’s question-and-answer period at the Board of Supervisors, Lee gave an ambiguous answer to a question by Chiu on whether he supports more private auto restrictions on Market. Lee said he’s behind finding ways to improve Market “for all users” and “supportive of initial trials and pilots,” but skirted around the issue of more immediate private auto restrictions. A phone call and email to the Mayor’s Press Office were not returned. PCOs? Please let those of us not in on the jargon know what this acronym stands for. Parking Control Officers. They stand there and make sure drivers don’t try to be the last one thru the light cycle – which 99% of the time ends in them “blocking the box” (stopping in the middle of the intersection). In other words, stop pedestrians from crossing so more cars can turn right. Why not forbid turns at New Montgomery? Second St is only 50 feet away. With Ed Lee being “ambiguous” on this issue, how the hell was he the 3rd endorsement by the bike coaltion? That’s a complete disaster. God Bless Chiu and Avalos, but at this point I think they are behind Ed and Dennis, and Dennis would be a much better result than Ed. No matter who you use for your first 2 votes, if it’s close you need to use your 3rd one for the “runoff” between the frontrunners. Maybe you get lucky and your chosen one wins, but if not, the 3rd vote is the critical one. Not to be confused with PCCs, the “streamliner” trolley cars that run in the middle of Market St. And yes, to all who post here, please use the full title before using acronyms that may not be familiar to everyone. Especially after the stunt Ed Lee pulled on CC. There is zero reason he should be the 3rd endorsement. But hell, if he can do nothing and be “ambiguous” and still pick up an endorsement, why would he do anything but the least? The mayor has consistently been surprisingly noncommittal on further traffic restrictions trials on Market Street. His response to this on the SFBC questionnaire is just as evasive as the one he gave the Board of Supervisors last week. I’m kind of baffled why he’s so hesitant on this, given that further restrictions are now firmly in the mainstream: most of candidates are either for a car-free trial outright (Chiu, Avalos, Herrera) or at least cautiously trying more car-restrictions (Dufty, Rees). Missing the chance to implement a car-free Market on a trial basis for evaluative purposes before repaving in 2015 would be a true shame. Just as bad would be missing the chance to get a firm commitment from all of the top candidates that they will implement further bold trials. Of course, Ed Lee is alone among the candidates in that he could get this rolling tomorrow — no excuse to not set more car-volume-reduction trials in motion before election day! What happened to “Rock on Ed Lee!”? So far, the restrictions on private car travel on Market Street have resulted in an insignificant speed up for MUNI — just 3%. What is that? About 10 seconds per bus pr trolley ride? Yet Streetsblog continues to advocate for a car free Market Street, as though that’s going to really help transit. A lot of the problems noted in the article are from cars crossing Market Street. So how is getting private cars off the length of Market going to change much of anything. I am no expert on transit, but I doubt the car-free strategy will deliver what is being promised. The only benefit from it that I can see so far is better bicycling conditions (for which I am grateful, btw). 3% is pretty significant when stretched out over multiple runs on multiple lines. Also, being a 30/45/8x rider, the private auto traffic ON Market routinely blocks the box at 3rd Street forcing Muni to wait through many light cycles (drivers I spoke to have said upwards of 20 minutes) to cross Market. Also, private autos turning onto New Montgomery and 2nd back up Market and slow Muni there as well. Yep, 3% is big given what a small adjustment was actuallymade overall. Again, the point is we should try this, and have our discussion be an empirically based one instead of purely speculative. Do it as soon as possible, on a trial basis, and use the results to make a truly informed decision about the future.